The arrival of European settlers to North America in the sixteenth century had disastrous consequences for the indigenous population of the continent. Native Americans were subjected to systematic violence, forced removal and diseases. By the nineteenth century, the Indian population was reduced from about ten million to 237,000. Once the population had been nearly destroyed the United States and Canada switched to a new tactic in order to continue the destruction of the indigenous people. In the early nineteenth century a policy of assimilation was created. The goal of this policy was from the outset to eliminate all American Indians culturally recognizable as such by some point in the mid-twentieth century. In the 1860s, the federal government set up 48 “day schools” near some of the reservations. Indian students would attend the schools during the day and then return home at night. The government hoped that this system would allow the students to civilize their parents, as well, by sharing what they were learning at the day schools. However, this system was dysfunctional as the day’s teachings were quickly erased over night by the return of students to the Indian Reservations. Out of this assimilation policy the idea of residential schools was born. Residential schools were an initiative that began during the 1870s in which it was ideally intended that every single aboriginal child would be removed from their home, family, community and culture at the earliest possible age and held for years in state-sponsored “educational” facilities, systematically deculturated, and simultaneously indoctrinated to see their own heritage and themselves in terms deemed appropriate by a society that despised both to the point of seeking as a matter of policy their utter eradication. A key player in the crafting of these residential schools was Army Lt. Richard Henry Pratt. Pratt was a veteran of the Civil War in the southern plains of the United States. In 1875, Pratt was assigned to transport 72 prisoners of war from the Cheyenne, Arapaho, Kiowa, Comanche and Caddo tribes to St. Augustine, Florida. During this trip Pratt used his beliefs about education to try and assimilate the indigenous prisoners. He started by teaching the prisoners English and focused on many concepts of Christianity. In 1878 the prisoners were finally freed, 62 of them attended the Hampton Institute in Virginia. This was a college founded by black abolitionists that trained people to become teachers. 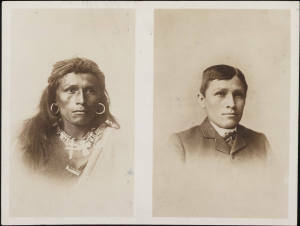 Pratt publicized the success of his experiment through a series of “then-and-now” photographs showing the “savage” versus the “civilized” Indians. One of Pratt’s “then-and-now” photographs can be seen here. This picture comes from the Richard Henry Pratt Papers and is presented by the Beinecke Rare Book & Manuscript Library at Yale University. The photographer is John N.Choate who took this picture in 1882. John Nicholas Choate was the principal photographer for the Carlisle Indian Residential School from its opening in 1879 until his death in 1902. Choate’s work is important because he was the only photographer at the Carlisle school and through his photographs he left an extensive record of visual documentation regarding one of the primary residential schools at the time. The description of this photo is cited as “Tom Torlino, Navajo, before and after.” Usually it is hard to find much information on the subject of photographs such as these but in this case I was able to uncover a fair amount of detail. 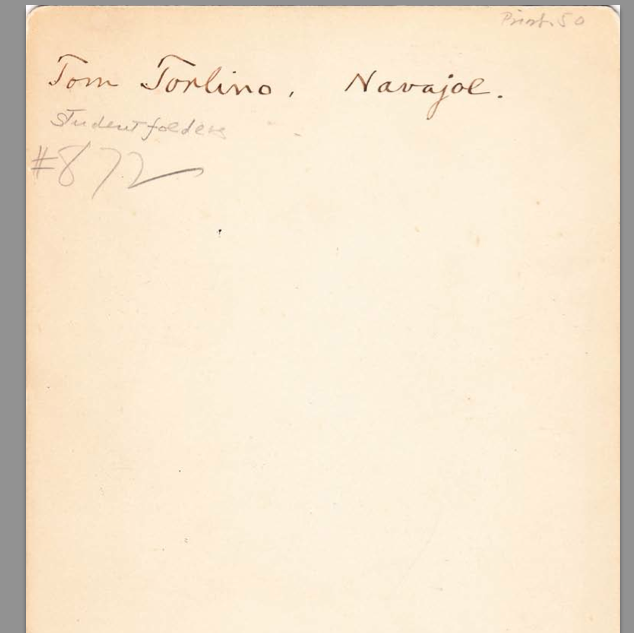 Using the Carlisle Indian School Digital Resource Center, I was able to actually view the student file of Tom Torlino. He arrived at the school on October 21, 1882. This “after” part of this photo was taken approximately three years after his arrival. 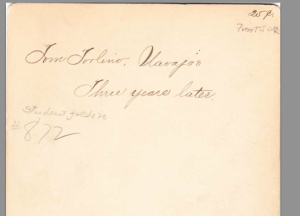 He spent a total of four years at the Carlisle school, finally departing in 1886. 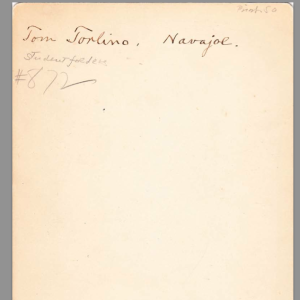 Based on the caption of the photo and his school file he was a member of the Navajo tribe. 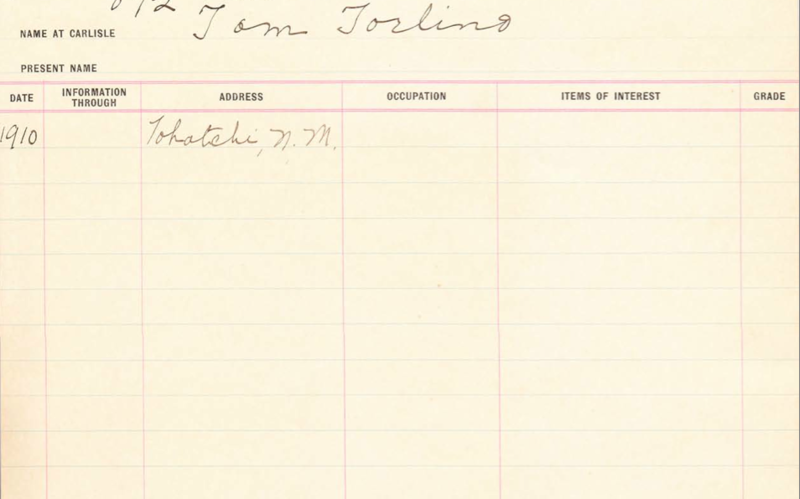 The school file was also able to provide his whereabouts after leaving the institute, stating that he was living in Tohatchi, New Mexico in 1910. 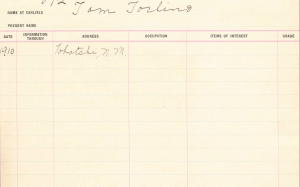 The student file also shows Tom’s student number, listing him as number 872. I have tried to include pictures of Tom’s Student File. However, they can be more easily viewed online at the Carlisle Indian School Digital Resource Center. Pratt’s experiment was becoming influential. Distinguished visitors began to visit from all over the country. Pratt convinced Congress to allow the establishment of a long distance educational school in Carlisle, Pennsylvania. He went to the Pine Ridge and Rosebud Sioux reservations in the Dakotas and convinced parents and tribal elders to allow him to take 60 young boys and 24 girls to a new boarding school. The Carlisle school followed strict military style regimentation. Students were prohibited from speaking their native languages. Instead, they were supposed to converse and even think in English. If they were caught “speaking Indian” they were severely beaten with a leather belt. The Carlisle residential school and its teachings became the foundation for other residential schools. Between 1880 and 1902, 25 off-reservation boarding schools were built and 20,000 to 30,000 Native American children went through the system. That was roughly 10 percent of the total Indian population in 1900. This number eventually expanded so that at its peak the complex of Indian residential schools was large enough to accommodate about half of all Native North American children at any given moment and something on the order of eighty percent of several succeeding generations of native youngsters underwent some portion of their schooling therein. In the schools students were issued uniforms expressly intended to separate them from the excessive individualism of their own traditions by reducing them to sameness, to regularity to order. Many times students would be kept in school year round and for as long as a decade without neither visits to their homes or visits from their families where possible. Even letters were sometimes withheld because of the deleterious influences such interactions might exert It is also important to note that there are many cases of sexual, physical and mental abuse occurred at the Indian residential schools. While not all boarding school experiences were negative. Many of the Indian students had some good memories of their school days and made friends for life. They also acquired knowledge and learned useful skills that helped them later in life. The overwhelming majority of survivors of Indian residential schools live to tell traumatic experiences. Ward Churchill, Kill the Indian, Save the Man. (San Francisco: City Lights Books, 2004), 12. Sally Jenkins, The Real All Americans: The Team That Changed a Game, a People, a Nation,”(New York: DoubleDay, 2007), 57.